For many Russian tech startups, the colossal U.S. market with its abundance of investors seems like the promised land. The U.S. also happens to be the Skolkovo Foundation’s most active partner, the foundation’s president Victor Vekselberg told foreign diplomats at last year’s Startup Village. But entering any new market or finding an investor there, let alone one the size and complexity of the U.S., is no easy feat without insider knowledge and experience. Michael Maziar, investor relations manager for the Advanced Technology Development Center (ATDC) accelerator-incubator in Atlanta, Georgia, visited the Skolkovo innovation centre late last month, where he gave resident startups some tips on navigating the vast labyrinth of U.S. investment. Michael Maziar has been helping startups to raise investment in the U.S. for the last 10 years. Photo: Sk.ru. Maziar’s first piece of advice was somewhat unexpected, coming from someone who professionally helps startups to raise money, as he himself admitted. His tip was: not all startups actually need to raise investment. “It’s a very romantic notion that startups have to raise money,” he told an audience of tech entrepreneurs at the Skolkovo Technopark on August 23. 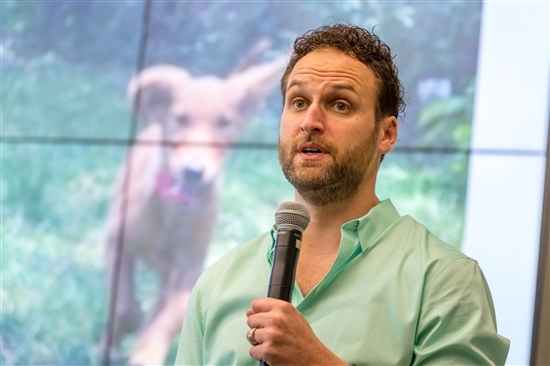 “To believe that the next step after an idea and prototype is to have funding, that you need to be pitching VCs, is a broken notion,” he said, adding that just 1 percent of companies actually obtain venture capital. U.S. companies on average need 80 to 100 meetings before they get their first investment, he said, explaining his position. Working on the basis that about five hours’ preparation time is required for each meeting, that adds up to a total of 500 hours to get the first cheque: time that the entrepreneur is not using to focus on running their company, argues Maziar, who has worked with startups for 10 years and also has his own startup. “The best source of funding is sales. We don’t celebrate when a company gets their first $500,000 contract, but we celebrate if they raise that from a VC. We focus on the wrong things,” he told the Russian startups. “I don’t think [political] tensions will affect Russian startups’ success in the U.S. if your solution solves a problem on a day-to-day basis, whereas tensions don’t affect daily life. Investors are the ultimate capitalists, so if it’s a good deal with a good founder and solid technology, they don’t care” - Michael Maziar. There are sometimes very good reasons to raise investment, however, such as to ensure a faster market entrance or accelerate technology, says Maziar. If raising investment is the right thing to do, then the startup needs to focus its efforts on finding the perfect match for its business. 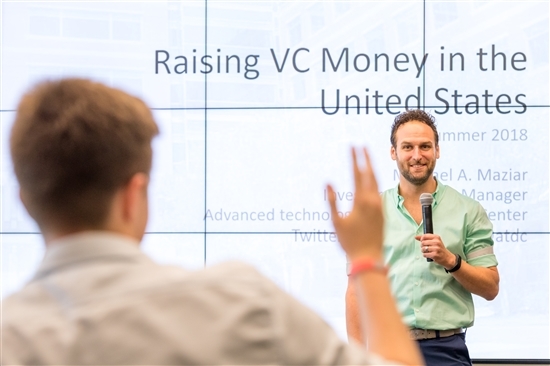 There is far more to the U.S. VC scene than just the giants, such as Y Combinator, 500 Startups and Techstars, he pointed out. Many of them are focused on specific industries or technologies, and these may be of more value to startups. “Think about your alignment with an accelerator or incubator,” says Maziar. The U.S. is also home to many corporate accelerators, including those run by Coca-Cola, Delta Air Lines and other household names, he said. There are over 23,000 accelerators in the U.S. alone, Maziar said, urging Skolkovo startups to find the one most suited to their requirements. Photo: Sk.ru. Once startups have identified investors they would like to meet with, they should go to meetings fully prepared, with a very detailed financial plan (and further down the line, if a deal is on the cards, the company should be prepared to share their due diligence information with the future investor). When approaching investors, there are two key things, according to Maziar: traction and team. The former is used to convince investors that the startup is worthy of their funding. “Traction can come in many different forms: the best is sales or customers – they are great validation for your business,” says Maziar, along with successful pilot projects, purchase orders, letters of intent, test users that will eventually become paying members of a service, and previous investors. Selling the company’s team is no less important, according to the investment expert. “I think one of the biggest mistakes I see entrepreneurs make is not talking enough about the team. What is your team’s specific competitive advantage? Why are you better? Why is your team the team that can make this idea happen?” he says. If a startup doesn’t have the ideal balance of one business co-founder from the industry the company is targeting, and one technical co-founder, the right investor can help to make up for that deficiency by acting as a regular mentor, says Maziar. “You have to be coachable and recognise what you don’t have, and what you need. Look for a VC who has expertise that you need,” he advises. On the other hand, and despite their name, angel investors should not be confused with philanthropists, he cautions. They expect major returns on their investment – often up to 20 times what they put in – and fast. The most dangerous kind of angel is one who doesn’t know the market the startup is working in, or doesn’t know how to work with startups, but has a big cheque that can be “very, very tempting to take,” warns Maziar. Maziar recommends finding the right angel investor by researching the entrepreneurial hubs located across the U.S.
“Every city has one, so start to map out different markets that are a good fit,” he advises. 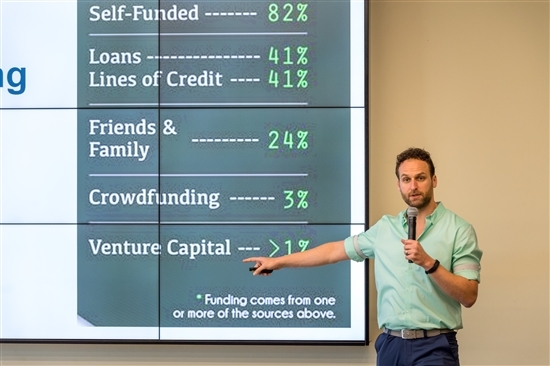 Only 1 percent of companies actually secure venture capital, Maziar reminded Skolkovo startups. Photo: Sk.ru. The American Midwest, known as the breadbasket states, are focused on agricultural technology, so they’re a good place for investment in this field, said Maziar. For renewable energy, California or anywhere along the east coast are the places to be. New York – home to Madison Avenue and Wall Street – is the best place to go to raise money for companies working in marketing and advertising and fintech, while for payment technology, Maziar recommends the city of Atlanta in his home state, Georgia. “Atlanta is home to five major credit card payment processing companies, and 80 percent of transactions in the U.S. pass through there, so there’s a lot of payment technology talent and expertise there,” he said. For cybersecurity, Washington, D.C. is the place to be, since the Pentagon, the CIA, FBI and other government agencies that are the top costumers of such technology are all located there or close by. Following his talk, Maziar, who has during the course of his career reviewed thousands of presentations for fundraising, watched brief presentations by several Skolkovo resident startups including Med.me, Qrepublik, Motorica and PimPay, and gave them instant and detailed feedback on how to improve their pitches when targeting an investor. His advice ranged from explaining more clearly the problems that the technology is solving, including more data, more detailed financials and “more information about the business model, less about the product” to modifying the style of the presentation and the order of the slides. Asked by one entrepreneur in the room whether the tensions in political relations between the U.S. and Russia had affected the chances of Russian startups finding investment there, Maziar was unequivocal. “I don’t think the tensions will affect Russian startups’ success in the U.S. if your solution solves a problem on a day-to-day basis, whereas tensions don’t affect daily life,” he said.